The latest addition to the Megabooth production line is the ultimate 3 in 1 party machine. First up is the Karaoke Photo Booth, a state of the art machine with all your club classics built in to ensure you capture the moment one of your tone deaf guests sing a chorus in the wrong key, or the awkward moment your other half forgets the words to Queen’s Bohemian Rhapsody. All the tunes will be belted out through hi-tech Bose speakers, which will leave some of your guests partially death for a few hours but most importantly ensuring your night goes out with a bang. 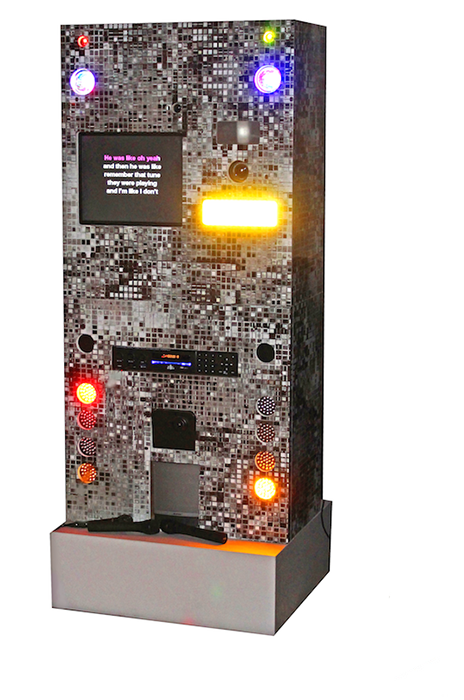 The stand-alone Karaoke machine offers simple touch screen technology that once you hit start; the camera takes care of rest. Then, you can choose your favourite Instagram filter, whether you want to give your images a vintage glow or classic black and white finish before sharing them with the world via Facebook, Twitter and Email. The ‘hidden’ gem built into our Karaoke photo booth is a video camera that guarantees not one stone is left unturned from your event… imagine one guest at the end of the night belting out Frank Sinatra ‘New York New York’, priceless. Best of all we can provide a compilation video of all the best bits, so you can relive the event, wedding or birthday bash for years to come. Inside all our booths are top of the range powerful SLR’s to take professional quality pictures. What better way to break the ice than to encourage your guests to have their photographs taken? When you book a photo booth with us included in the price will be a box of props that you can either customise or leave up to us to decide your fate, branded photos and 1 or 2 members of staff to jump in on your selfies and occasionally photo bomb your pictures. Seriously though, the event will be supervised at all times and our staff will make sure everyone at the event will take home a precious memento. This means that at a normal 4-hour event with 150 Guests, we would print around 400 copies, other companies will do around 120 – just saying.